Three days ago, two successive sixes from Darren Sammy had launched Sunrisers Hyderabad into the IPL Eliminator. Three days later, two successive sixes off Sammy's bowling, and from Brad Hodge's bat, launched Rajasthan Royals into the second qualifier, where they will take on Mumbai Indians for a place in the final. The victory also meant Royals sealed their place in the 2013 Champions League Twenty20. Hodge's was a blinder of an innings in many contexts. Prior to this, he had not spent a lot of time in the middle, Rahul Dravid preferring to use him as a finisher. He came in at 57 for 5 in a chase of 133 on a slow, uneven pitch, on which almost everyone had struggled for timing. He was up against the best attack of the season in a knockout situation. Royals had been up for a week against a spot-fixing controversy that had shaken their team and messed up their combinations. Hodge's response was one befitting a man who has made the most Twenty20 runs in the world. When he cracked the second ball of the last over 96 metres into the crowd beyond the long-on boundary, he finished on 54 off 29. He hit five sixes on a pitch where the first one took 14.1 overs to come. This match was Royals' after a start of 50 for 1 inside seven overs. Shane Watson was another batsman who was making a mockery of the difficulties posed by the pitch, pushing forward and getting boundaries with sheer power. His pull off the legspinner Karan Sharma was headed for six over deep midwicket when Sammy jumped several feet to intercept the ball, and turn the game. Royals lost a wicket each in the next three overs to slip to 57 for 5. Sammy did most of the damage, keeping it straight to hit the stumps, as Dishant Yagnik and Stuart Binny missed. Ajinkya Rahane popped one back to the other Sunrisers legspinner Amit Mishra. 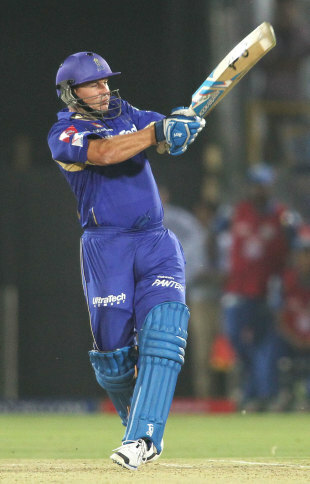 Fifty-eight were needed from 40 when Hodge tore into Karan, a bowler most sides had found difficult to get away. Two sixes and a four in the space of four deliveries. He followed it up with a straight six off Mishra in the next over. Sunrisers were visibly stunned, and Mishra, whose first three overs had gone for eight, was irritated. Sunrisers hung in, though, despite a wayward 18th over from Dale Steyn. Hodge tried to hit a six almost every ball off Thisara Perera in the 19th, and managed five runs. It came down to 10 needed off six, but Hodge needed two deliveries. Sunrisers did well to get to 132 from 67 for 3 after 14 overs. Royals went in without a spinner, but their various kinds of medium-pacers tied Sunrisers down with lack of pace and width. Vikramjeet Malik, playing his second match of the season, sent back Parthiv Patel and Hanuma Vihari in the space of four balls. Shikhar Dhawan and Cameron White took their time to push on. White, especially, looked in good touch but both fell in trying to step up the pace of scoring. Sammy and Perera were going to be key at the death but again, both fell just as they were starting to dominate. Sammy came out swinging sixes but was run out by an accurate, powerful throw from the deep by the substitute Rahul Shukla for 29 off 21. Perera zoomed to 11 off 6 before edging behind. It was still not an easy target by any means and Royals' inexperienced middle order seemed to blow it, but Hodge was lurking at No.7 to deliver the knockout punch.